Has there ever been a more pathetic newspaper than the Sun? HAS there ever been a sleazier sporting organisation than FIFA? If there has, then the Sun couldn't have possibly been as conflicted about them as it has FIFA. This happening upon the iniquities of world football's laughably corrupt governing body suddenly came to the paper the day after England's bid for 2018 World Cup was rejected, the rattle being thrown out of the pram in a fit of petulance not even the stroppiest of teenagers would sink to. FIFA BUNGS RUSSIA THE WORLD CUP it screamed, deciding that it had to have been backhanders and not our dire campaign which resulted in the pitiful 2 votes we picked up. It was oh so different only a couple of days earlier. First the paper attacked the BBC for daring to broadcast a Panorama special on FIFA's easily bribed insiders, misrepresenting the documentary as not containing any new allegations of wrongdoing when the opposite was the case, the editorial being doubly hypocritical for referring to an investigation by its sister paper, the Sunday Times, which went over highly similar ground as a "legitimate inquiry". The following day it led with a truly pathetic "open letter", all but begging FIFA to ignore the BBC's traitorous outbursts and instead back England's bid. "Your brilliant tournament" it grovelled, tongue wedged firmly up Sepp Blatter's backside, Britain's supposedly most trenchant anti-establishment, irreverent and outspoken scandal sheet reduced to genuflecting before the sleaziest sporting organisation ever to have existed. Our Premier League is the world's greatest football competition. So long as FIFA is in charge, the World Cup will not be worth winning. The Sun will doubtless then put no pressure whatsoever on the England team come 2014, nor will it hype up our chances for months beforehand. Who knows, now that the daily paper of record has said it's not worth winning, we might just triumph. If the World Cup can only be hosted through bribery and corruption, England are well out of it. Ex-FA chairman Lord Triesman reveals the favours he says FIFA executive members demanded for backing England's 2018 bid. One wanted a knighthood. Another, vice president Jack Warner, allegedly sought £2.5million for a schools project - with the cash channelled through his own pockets. A third asked for lucrative TV rights, while a fourth demanded: What have you got for me? MPs investigating why England's bid failed also have evidence another two chiefs took bungs for backing Qatar's successful 2022 bid. Two more FIFA bosses have already been banned, meaning a third of FIFA's top team is implicated. Yet FIFA president Sepp Blatter sees no need to quit. As sport secretary Jeremy Hunt says, these allegations if proved should prompt a criminal investigation. The Sun still thinks you're stupid. There's a piece in the Sun today touchingly described as a "sting" on the Yemen-based associate of al-Qaida in the Arabian Peninsula Anwar al-Awlaki. It's a strange sting, not only because there is no evidence whatsoever that Anwar al-Awlaki was involved with it, despite the Sun's claims, but also because it imagines the paper's own readers are stupid enough to confuse the group with Awlaki. FIRST, we obtained an email address for Awlaki's Yemen-based "al-Qaeda in the Arabian Peninsula" network hidden in material on an extremist website. THEN our investigator, posing as a UK-based fanatic named "Q. Khan," sent an email addressed personally to Sheikh Anwar al-Awlaki. FINALLY, we received a reply from the terror chief - convinced he was in contact with the leader of a British cell eager to obey his commands. 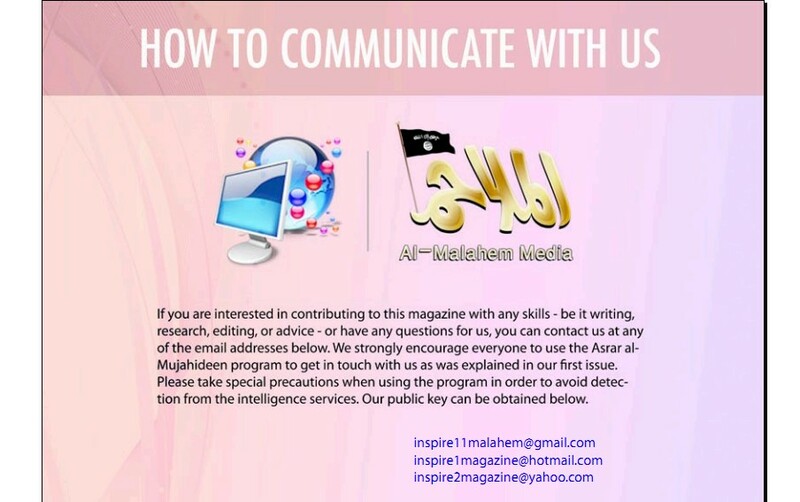 I too have managed to obtain the email address the Sun used, cunningly hidden as it was on the penultimate page of the latest edition of Inspire magazine, a periodical published by the propaganda wing of AQAP, al-Malahem media. 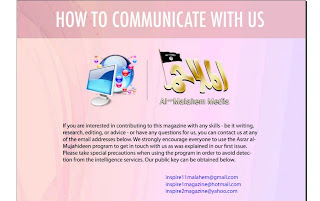 While the magazine does indeed print two articles by Awlaki, along with translations of communiques from other al-Qaida high-ups, the magazine itself claims to be edited by someone called Yahya Ibrahim; others have said the magazine's actual editor is Samir Khan, a former blogger who moved to Yemen a few years back, and who also contributes a comment piece. Is it then even slightly realistic to imagine that by emailing an address in a jihadi publication you're likely to be straight in touch with someone as senior as al-Awlaki? Hardly. While Awlaki previously managed to maintain a blog, this was shut down shortly after the Fort Hood shootings. More recently, a judge in Yemen has called for him to be captured dead or alive, and Barack Obama has also authorised his targeted killing. As was shown with the death of bin Laden at the weekend, when you're in such a position, having direct contact to the internet or even a phone line is potential suicide. jihadica.com has also been sceptical about the magazine's actual links to AQAP, even though it claims to be produced by their media arm. It's possible that those the Sun did contact may have asked al-Awlaki as to his response to their "sting", but if they did then they hardly make this clear: they simply signed their message as "your brothers at al Qaeda of the Arabian Peninsula". Their advice also was hardly specific, apart from how they should conduct their operation, and as they say, they shouldn't really contact them again as it might well result in their plot coming to the attention of the authorities. This isn't to play down the fact that the Sun has at least got in contact with someone connected with the Inspire magazine and that they've suggested what their next step could be in launching an attack: that's still a serious thing. That though isn't a good enough story, or worth clearing the front page for; it had to be al-Awlaki himself, even when it's instantly apparent they almost certainly weren't talking to him. Tory MP Patrick Mercer said of our probe: "I have no doubt the Home Office will want to investigate how simple it is to get in touch with Awlaki and his people. "He is a leading contender to fill the power vacuum left by Osama Bin Laden." Yes, that would be the same Patrick Mercer who previously contributed to such investigative triumphs in the Sun as the "TERROR TARGET SUGAR" masterpiece, and also told the paper that the Taliban were making "HIV bombs". The ISAF response when asked about these deadly devices was "no reports, no intel, nothing". Sums up the Sun and Mercer's critical faculties fairly well.